We are so sad to report that Kip and J.D. 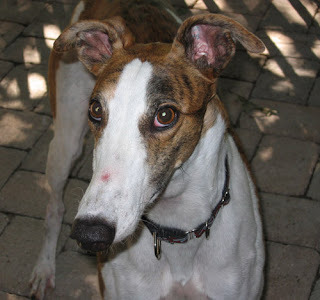 (long time adopters and volunteers) lost their beloved greyhound, Fitzgerald, yesterday. We had been communicating recently with them as they wanted to adopt Merlot, one of our available brood seniors. We had made plans to take Merlot to them Thursday. Wednesday evening, they had a vet appointment for Fitz to check on a limp he had developed lately. Fitz had corns in the past and Kip and J.D. thought that he had another corn. However, the vet visit resulted in a diagnosis of bone cancer. Fitz had also lost weight so that in addition to the x-rays revealed that the cancer had invaded other organs of the body. It was devastating news for both Kip and J.D. They struggled with the ramifications of the diagnosis and just what they would do with this news. After a lot of soul searching and talking, they decided that it was in Fitz’s best interest to let him go. They did not want to risk him breaking the leg or having him live in pain. They made the appointment with their vet. Yesterday they gave Fitz the entire day. They took him for a short walk, a car ride (which he loved! ), gave him his favorite food and treats, etc. They and their two other hounds accompanied Fitz to the vet where they all spent their last minutes together saying goodbye. Fitz passed peacefully to the bridge surrounded by everyone we knew. This was a hard and painful decision but they felt that this was in Fitz’s best interest not to allow him to become sicker and feel any more pain. Kip and J.D. adopted Fitzgerald in 2006. He was more than a pet; he was a true member of the family. Fitz was quite the character – a wonderful sweetheart of a dog that loved everyone and was loved by everyone who met him. He had a long nose with an overbite and teeth that showed, giving him a permanent smile. But he smiled at everyone because he love everyone. He was a wonderful meet and greet dog and a great embassadog for greyhound adoption. We know that Fitz will be greatly missed by his family. But we also know that he had the best home. Fitz was eight years old in May of this year. Rest in peace sweet boy; you were greatly loved.